Vincent Bollore with a BlueCar EV. Up to 3,000 are expected to be available to hire around Paris by the end of next year. PARIS - Billionaire entrepreneur Vincent Bollore hopes his Pininfarina-designed bubble-shaped electric cars will help clear the traffic-clogged arteries of Paris, as well as providing a charge to his nascent battery business. The Autolib cars will be available for hire in a two-month trial starting Monday. The hire fee is 4 euros to 8 euros per half hour for motorists prepared to pay a membership fee starting at 10 euros for a day of driving. The 235 million euro ($321 million) project is the brainchild of Paris Mayor Bertrand Delanoe, who hopes to duplicate the success of Velib, the bicycle-sharing scheme he launched in 2007 and which has been copied by several cities in France and abroad. It's also a potential showcase for Bollore's eponymous industrial conglomerate, which is making the BlueCar vehicles involved in the scheme and which are based on a lithium-metal-polymer battery, a different technology from the lithium-ion batteries other car makers are using. Bollore told journalists on Friday he expected the project to make a profit in a number of years. "We estimate that it will be profitable from the seventh year, and an industrial group like ours is used to (its investments) turning a profit from the sixth or seventh year," he said. The scheme echoes increasingly popular car clubs such as City Car which allow members to hire a local car for as little as an hour at a time. "We want to persuade people to shift from the concept of owning a car to that of using a car," Autolib General Manager Morald Chibout told Reuters. The city of Paris has spent 35 million euros ($47.8 million) in building the car rental stations, while neighbouring communes have contributed 50,000 for each station. The Bollore group, which has invested 200 million euros in the project, will pay a 750 euros annual fee for each car space. Taking a cue from the success of Velib, the project is aimed at reducing the need for the private cars that hog Parisian boulevards as well as offering locals and visitors a chance to discover electric cars. The service will debut with 66 cars and 33 stations throughout Paris, but will expand to 3,000 vehicles and more than 1,000 stations by the end of 2012. The project gets underway as top automakers test the market's enthusiasm for electric cars on a large scale in Europe. Renault and its Japanese sister company Nissan Motor Co, which have invested 4 billion euros in electric vehicles, have begun selling a few such cars ahead of volume production and sales set to kick off in 2012. Bollore's cars are being manufactured exclusively for the car-sharing service. First unveiled at the 2005 Geneva motor show, the bubble-shaped four seater has been designed and manufactured exclusively for Bollore by Italian designer Pininfarina, famous for sculpting Ferraris and Maseratis. Unlike Pininfarina's more upmarket designs, the BlueCar has been kept simple, with basic controls that are meant to be intuitive and easy to understand. The car is powered by batteries manufactured by Bollore and can travel up to 250 km between charges which will take about four hours. Bollore says the batteries are safer than the lithium-ion batteries used by most of the car industry because they are less prone to overheating. They are also more stable when being charged and discharged. With estimates for the electric vehicle market of between 20 billion and 50 billion in 2020, Bollore's bet may pay off if Autolib becomes a success. Soaring insurance and parking costs in French cities have already persuaded 25 percent of its citizens to reduce or give up using their cars, according to a study published last year by Chronos TNS Sofres. Valentine de la Celle, a 30-year-old Parisian mother of two, would seem to be the typical target for the service. She doesn't own a car, but expects to start using the station on Boulevard Haussmann for short trips, as she lives nearby. "We're doing building work at home at the moment and to take things to the tip I'd have to hire a car, which is difficult," she said. "But the scheme needs to be quick and simple, otherwise people will not use it." 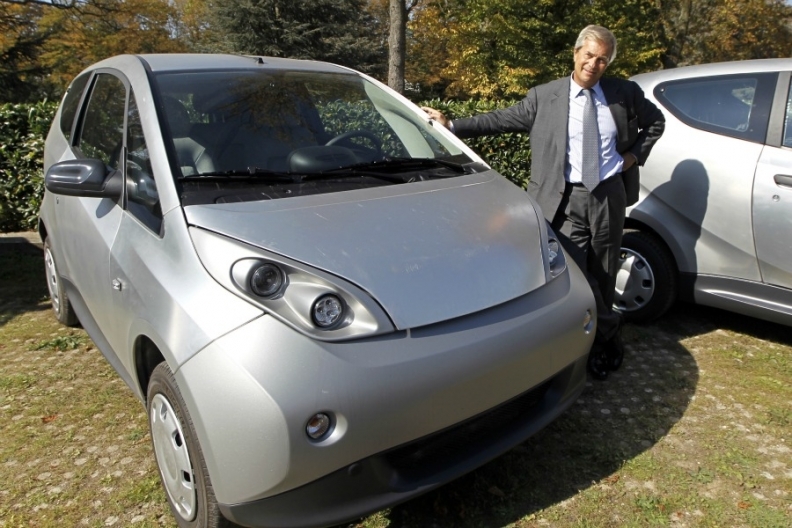 Bollore says picking up an Autolib vehicle from a station and returning it to another will only take a few minutes. Before hiring a car, drivers will have to register at Autolib's flagship office in central Paris or at kiosks located near some stations. A driving license, ID card and a credit card will be required to sign up, along with an uncashed deposit. Users will be able to sign up for daily, weekly or annual memberships ranging from 10 euros to 144 euros for a year, with users paying more depending on the length of time the car is used. The tiered pricing system is designed to encourage hiring the cars only for short trips, said Annick Lepetit, Paris' deputy mayor in charge of transportation. "We are not here to compete against traditional car rental businesses," she said. Unlike traditional rental cars, Autolib vehicles will be tracked by an operational center which will be staffed 24 hours a day to help drivers who run into difficulties. "We hope other cities will contact us to adopt our system," said Chibout. "Three cities have already called us."